Thanks Paul here is what I have on those components. The 647 IC's were also illustrated on the PCB layout page F-14-0 (PDF Pg. 27). The parts list on the next page lists these as IC1-4, IC1-5, IC2-4, IC2-5 (although I don't see the IC2-5 in the illustration). All 4 are a TA-7217AP. The NTE equivalent is NTE1370 - Integrated Circuit 5.8W Car Radio Audio Power Amplifier, 10-Lead SIP Case, 18V Operating Supply Voltage. The 622 transistor is labeled T D635. The equivalent part is the NTE 261 TRANSISTOR NPN SILICON DARLINGTON 100V IC=5A TO-220 CASE COMP'L TO NTE262. Hi Janice, so we are in the right area, but for it to go off completely both channels, even in a stereo amp quite unusual, not impossible though, given the problems you have had. I would first check you have power to the board, could be part of that cap problem we saw earlier, I would of thought there would be at least one fuse here, very odd. Paul...By you identifying more potential problem areas... I took a closer look to the caps and traces around those power IC's. Well, it's not looking good. There appears to be more cap leakage and trace damage on both channels . Hopefully the IC's are ok. All I can do at this point is to attempt to replace all the leaking caps...repair the traces...and add a fuse to the circuit. Luckily the components are at the accessible end of the PCB. So I don't think I'll have to remove the board. However the space is very tight next to the IC's. I'm trying to figure out how to remove the transformer to replace the big cap and fuse. I've contacted a couple members who have this projector for advice. 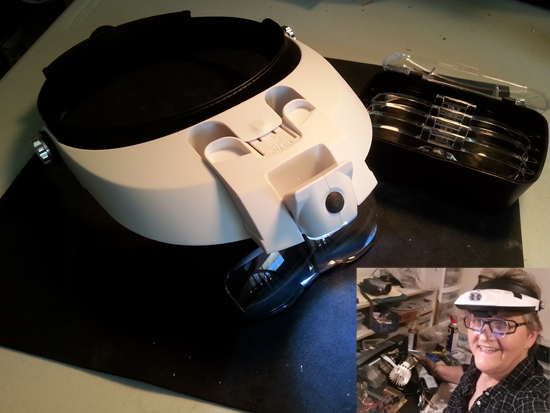 These repairs will take some precision and magnification tools as recommended by Phil. I'll also have to do a little more research on this type of trace repair. This will take awhile I'm sure. 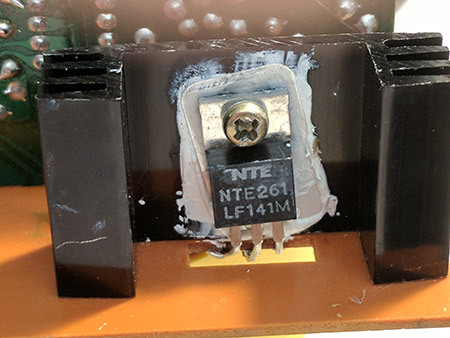 Concerning addition of a fuse, my opinion is this not very urgent as that needs at first to find the better area to fit it (certainly between rectifier and Transformer Output). Hi Janice, the caps are easy to do and relatively cheap, do them one at a time, but check those that look good too. the tracks are quite thin, not sure how these would be affected by the leaky caps, if could send them open circuit of high resistance ?. If you find that the amp chips have gone, be careful how you handle them, by this I mean physically. These can be zapped with static in the body, use something non conductive, plastic tweezers etc. Because you have no other functions other than the lamp circuit and forward projection, the power supply to other boards must be prime suspect, no power in no power out. I'm going to begin by removing the obvious leaking caps first. This will give me a better view of the condition of the traces. At first glance I see some oxidation (green) and corrosion from the electrolyte leakage. Since it doesn't appear there is any solder mask on the top side of the PCB I'm surprised not more of the traces haven't oxidized. I didn't hear back from Frank Arnstein...so just got out my screwdriver and gave it a go myself. Removing the transformer was easier than I thought it would be. 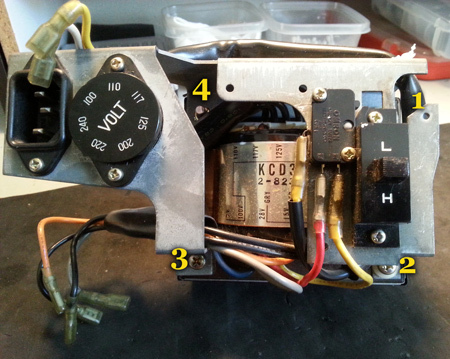 I just removed the screws marked 1,2, & 3 and also removed the motor. I got the transformer detached and moved off to the side. Although I am having trouble removing the screw connected to the ground wire. I don't know why it's in so tight. If I can get that screw out it will be completely detached and much easier for me to work on the PCB. If I can't...then I might just cut the wire. I removed the big 4700uf 25V capacitor and cleaned the traces. However, there weren't any components connected to those traces. The capacitor metered good...but I ordered a new one anyway. Relays by the looks of things Janice. Used to switch a large current circuit from a small one. A small current energizes the coil in order to move the contacts to switch the large current circuit on or off. If you want to test them, test the coil first for a circuit using your ohms range on your multimeter. You should see some resistance from the coil. Values vary dependent on number of turns and size of wire used etc etc. With the correct D.C. voltage applied to the coil, you should see the contacts move forward and back again, as voltage to the coil is applied, then removed. A spring returns the contacts to the normally open position. The energized coil moves the contacts into the normally closed position. These tend to fail more than anything else because of faulty contacts or because of faulty contacts movement mechanism. This happens after many years of use and/ or if arcing has occurred over it's lifespan. They are classed as a FCP (frequently changed part) in industry, just as bearings are, both being "consumable" components. You will want to use a capacitor from a reliable manufacturer like Panasonic (Matshushita), Rubycon, Nichicon, United Chemicon, or Suncon (formerly Sanyo). You might also want to go with one with a higher voltage rating. Mark...I ordered a Nichinon 4700uf 25v capacitor from Ebay, but it won't be here for another week. I saw that Radio Shack has a 4700uf 35v...but don't know who makes these for Radio Shack. I'm tempted to go buy it...since it is a slightly higher voltage. But, I'm just not sure of the quality. I would use the Nichicon. 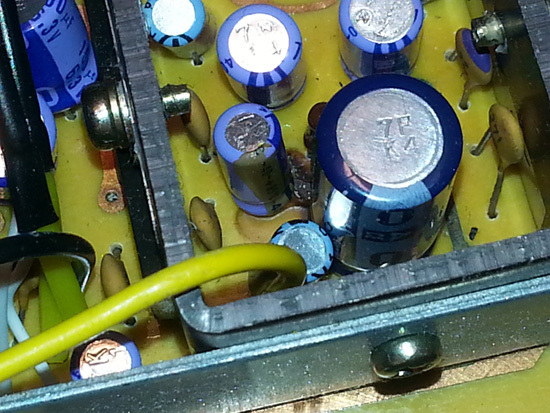 I have no idea who manufactures the Radio Shack capacitors. Mark...I checked again at what I ordered...it's a Panasonic GE capacitor, not a Nichinon. I've been ordering so many components lately it's hard to keep track. I guess I'll just wait. The Panasonic should be good. Usually these components are rated for tens of thousands of hours of operation at temperatures most of the way to boiling! 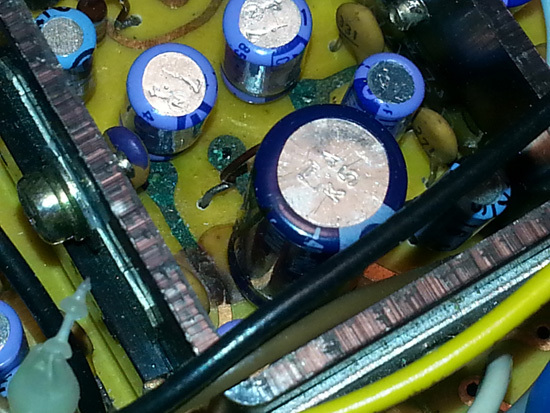 So any decent commercial grade capacitor should do you just fine. No worries Janice, you're welcome! 105 degree rated and 5% close tolerance. Reputable manufacturer, but the above is the more important. -but even if all you can find is 85C, don't lose any sleep over it. Unless the house is on fire that cap will never reach 185F. Just built to higher standard with greater head room, that's all Steve. Factor of safety and all that. Very often you see the 85C part rated at 2X hours of Mean Time Between Failures and the 105C part rated only X hours. It's possible they are the exact same part with a different label. My point is if Janice has an 85C part it's more than good enough. It's what the machine was probably built with in the first place since it's a consumer product. 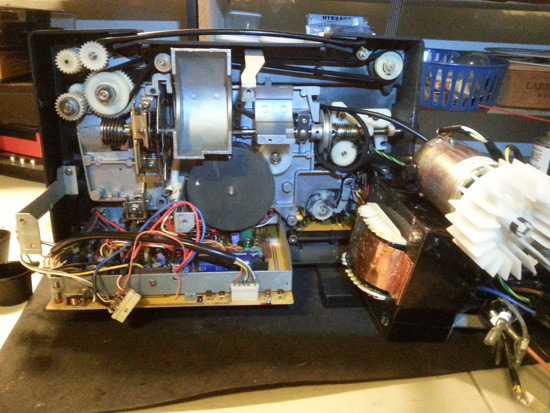 The life of a capacitor in a super 8 projector is actually pretty plush: two hours a week year round is a lot and that's 100 hours a year. If you can only find a thousand hour part you are already good for 10 years. If that thousand hours is really only at like 40C it's probably more than 20 years. 20 years of this kind of service, everything else in the machine will be a pile of rubble! If nothing else the shelf life issue eventually gets them all regardless of the rated hours. -105C part if you can, 85C part: no anxiety! Yes fair points there, as you say all of these things ARE considered consumable items so for the amount of use, many give to these things, I am sure you're right. I have to say though, I use my main projectors far more than two hours per week, so for the difference in price, I'd always plummet to fit the best available for my own needs. There is after all, very little differences in prices typically. As you say though, not everyone is using these things now to the extent I personally do, and no doubt, you do yourself Steve. I'd say an hour a week per machine would be a lot for me personally: I might only show one reel on a work night and I almost always run with two machines, so when it comes to even two 200 footers I do a changeover and the time is divided. I also rotate machines in and out of service and the guys on vacation can sit for weeks. I'm guessing when you change a lamp, you can still remember the last time you changed it. Yes Steve. Every time. With the exception of my ST 1200 nowadays and my 938 gets very little run time per annum now. I usually run a couple of features (two or three) and around 5 shorts per week. I am a shift worker, so I do get plenty of time to view the films I have when I'm off and the wife is in work. Plenty of time, yet still nowhere near enough for what is needed! Hi Andrew...in regards to the relays, thanks for the info. At this point I don't know if they are good or bad. I couldn't find these exact ice cube relays...but have located an equivalent if I need to replace. 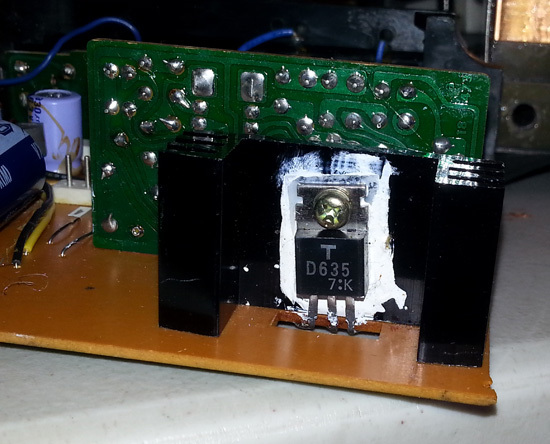 1)I'll start replacing the big capacitor and adding the 6 amp fuse. Then put everything back together and test it. 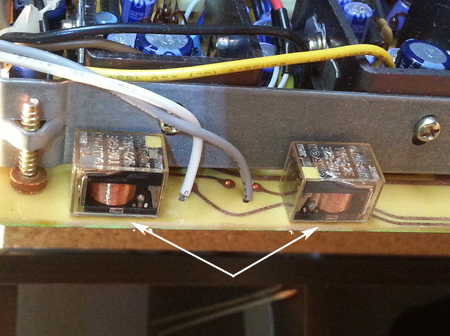 2)If still no sound... then I'm going to replace the power amplifier transistor on the small speed board. 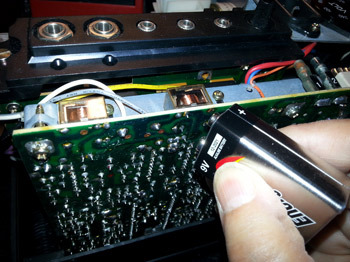 3) If still no sound...replace the two 470uf capacitors near the IC's. 4) If still no sound...test and possibly replace relays. UPDATE....No, I still haven't resolved the sound issue, but I haven't been working on the projector recently. If you venture back in this thread to my previous post you will see a list of my next steps. One of the to-do's in my list was to check the relays. I ran across a video on YouTube where this guy showed a nice little trick to test relays with a 9 volt battery. Replaced the transistor on the power board today. Unfortunately this component was not the problem and still complete silence. 1) Power is getting to the motor and it runs great. I do not know if power is getting to the sound board or amp.